Our tale begins in colonial India, where a brilliant storyteller becomes a cunning dubashi, a mateen becomes an ansari with a pompously glorified and contorted past, and a kathua—Kalaam—falsely ousted from his yarn-weaving profession, discovers a rare talent for cooking. 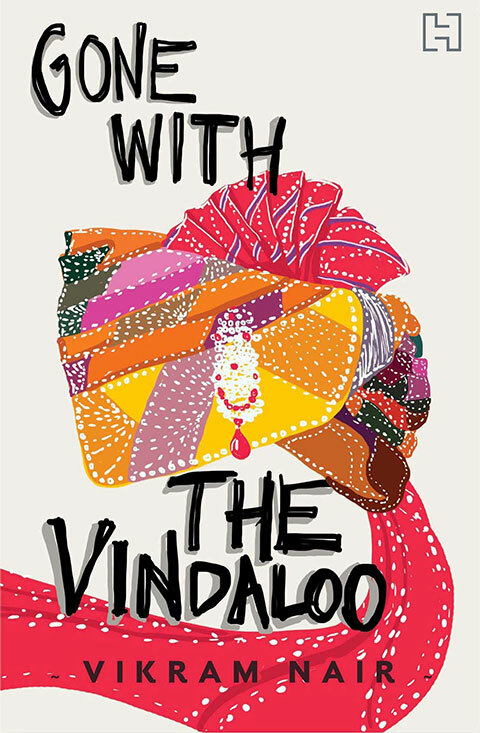 Vikram Nair’s Gone with the Vindaloo is divided into three parts: the first focuses on the story of Kalaam, his son Param, and his grandson Pakwaan. Pakwaan is a third-generation cook who works in the Mahadev household as an assistant to his father, the main resident cook. Woven into this is the narrative of the life of Mahadev, their employer, with his stellar academic background and I.A.S. credentials, his wife, and their three children. The eldest son, Tek Ram, is the recipient of continually mounting expectations and a constant source of disappointment for Mahadev, having always fallen short of his father’s academic ideals. The second part of the novel introduces us to Svetlana, a Russian-American disillusioned by the ideas of Western supremacy. In their search for purpose and success in life, the three adolescent characters, Tikky, Svet, and Pakwaan, find each other and are bound by vindaloo—a dish which sparks off passion and ambition in all three. This leads to the hatching of a business plan to bring vindaloo to the West, and a subsequent geographical shift in the story which takes us to 1960s America. In the U.S.A., Tek Ram can escape his mediocrity and make a future for himself free from the burden of his father’s expectations while helping Pakwaan to escape his own disappointing, mundane past. As the story progresses, we come across an eclectic bunch of characters, from British and Indian sahibs to the elite (and not-so-elite) holy men, Anglophile Indians, and “Indopheel” Americans. In the midst of it all lies our central character, the source of pride and applause, a metaphor for unassuming grandeur: the vindaloo that touches the lives of all, unhindered by superficial differences. Gone With The Vindaloo unfolds like a Matryoshka doll; there are stories within stories within stories. Somewhere, all the runaway threads come back to a single point. The book entertains you while being cheekily subversive. It takes no orthodox stands and does not bother with absolute rights or wrongs. The historical backdrop of the story provides context to the characters and their situations, but the crux of the novel is timeless. Sometimes comical, sometimes flippant, and sometimes a little too crude to read without recoiling, Nair’s debut novel is almost always relatable. The simple and warm narrative hops seamlessly between Hindi and English. Characters from very different backgrounds come together and then drift away, but everyone is in the same boat seeking something grand and fulfilling. The novel teaches you that standardisation and quantification can destroy beauty and kill art, and that those who feel truly fulfilled are the ones who realise that grandness lies in the simplest of things: in vindaloo, in a good bowel movement, and in the satisfaction that comes from a job well done. The novel is about simplicity and the celebration of it. It is about the pleasures of the body: ravenous appetites, sexual desires, and scatological releases. The author takes much pleasure in creating powerful, vivid images of food, and readers might be hard-pressed to get to the end of the book without building up a massive appetite. Gone With The Vindaloo is an easy, worthwhile read. It is humorous and unpretentious; a book that celebrates life in all its natural flavours. Ateendriya is a student of linguistics, and loves languages, books, science, and doodling. She often finds herself unable to distinguish between reality and fantasy and responds well to food and flattery.